Ike Davis has Valley Fever. Or at least that is what the Mets are saying Ike may have. In light of Mets team doctors' track record, though, it is probably safe to assume it's likely much, much worse. According to the handy WebMD, Valley Fever is a fungal disease that affects the lungs and has similar symptoms as the flu or a cold. It can sometimes cause a rash. It can also sometimes be deadly to someone with a weak or compromised immune system, spreading from the lungs to other parts of the body. It is most common in "dry desert areas of the southwestern United States, central California, and Mexico." 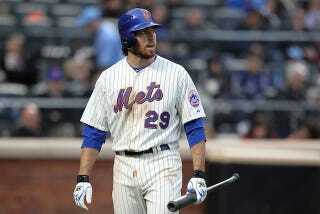 Ike Davis lives in Arizona in the offseason. Davis said Saturday that the results of blood tests administered in New York 11 days earlier have not yet been returned, and that he has received no official diagnosis. But manager Terry Collins acknowledged Saturday the club is treating Davis as if Valley Fever has been diagnosed and the Mets are monitoring their first baseman. "We're treating him as if that's what it is," Collins said. "We can't let him run down. That's what we've been told. We'll give him some days off. He says he can go, and he's been doing everything he's supposed to. But we need to be sure he doesn't push it." Davis, reluctant to speak publicly about the illness, did so Saturday. "I have to keep my immune system strong," he said. "No one has told me for sure what it is, and I haven't asked. But they're pretty positive it is [Valley Fever]. I'm trying to be positive about it. I'll just be careful the way they tell me to be careful." The Mets are not a very good baseball team, so there were not exactly high expectations this year, but Ike Davis is supposed to be a young, bright spot for the organization. Unfortunately, Ike's plight is not unlike his team's as he continues to be dogged by injuries and, now, this freak illness. Don't fret though, Mets fans, there's always Johan. He should definitely be ready for Opening Day.